Create a stunning spring landscape by adding frosty touches of elegance with Ice Age Tulips. Featuring angelic white petals encased in green, these bowl-shaped double blooms closely resemble peonies. A bounty of ruffled petals gives each bloom a full, layered look that contrasts beautifully with traditional tulips. Tulips (Tulipa double late 'Ice Age') flourish in climate hardiness zones 3 to 8 and love spots in the garden where they'll receive full or partial sun. 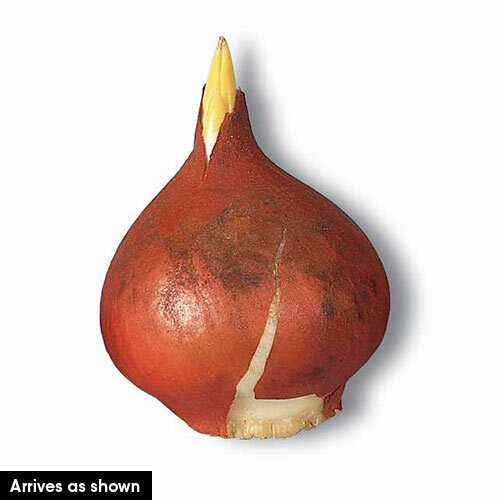 Plant the bulbs in the autumn, about 6 inches deep and about 3 to 6 inches apart in well-drained, clay, loamy or sandy soil for glorious late spring blooms. With very strong stems, these Dutch-sourced perennials can withstand strong winds and rain and make an excellent addition to cutting gardens. Add Ice Age tulips to borders along walkways for a polished look or plant them in masses of 12 or more to create an impressive focal point. The graceful Dutch tulips look at home in gardens with colourful irises, daffodils and other late spring flowering plants. Plant Ice Age tulips in sophisticated formal gardens with other varieties of tulips, placing them in colour-coordinated rows for an organised design. Take their beauty indoors by creating freshly cut bouquets. Enjoy the captivating sight of these wintry beauties long after the cold season has ended. Not your ordinary double tulip! 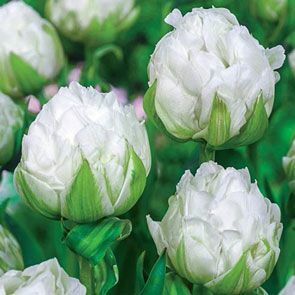 These 4" wide, wintry white flowers feature a froth of pure white petals surrounded by white outer petals embraced in green, all supported by very strong stems. Flower Color Pure white petals ebraced in green.